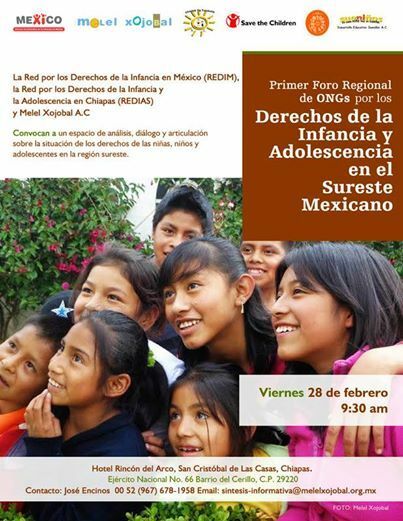 On 1 March, Melel Xojobal A.C., REDIM (Network of the Rights of the Child in Mexico), and REDIAS (Network for the Rights of Children and Adolescents in Chiapas) organized the first regional forum of NGOS on “The rights of childhood and adolescence in southeastern Mexico.” The forum intended to create space for analysis and dialogue toward the end of joining together the work of civil organizations which labor in favor of the rights of children, so that there be greater efficiency and cooperation in this struggle. Despite representing 35% of the national population (more than 40 million persons), children control only 6% of the country’s budget, with only a small portion of this going toward their protection. Juan Martín Pérez García, director of Redim, recalled that the rights of the child “are human rights and not small rights,” adding that adolescents comprise a full 50% of all femicides committed in the country. The doctor denounced that Mexico “is not implementing conditions to observe the rights of children.” It should be noted that, among the 176 recommendations made to Mexico by the Universal Periodic Review (UPR), just 7 refer to children and adolescents. Children make up a third of Mexico’s population and 40% of the population of Chiapas. Lamentably, the situation of children in the latter context is very difficult: Chiapas is one of the places with the fewest legal tools enshrined into public policy, and the statistics for children in the state are among the worst in the country, always below the national average. Chiapas has the least percentage of school attendance in Mexico and the lowest average number of years spent in formal education, but the majority of the population aged 12-17 is economically active. Chiapas occupied third place in the number of adolescent pregnancies (15-19 years), and it is retrograde in terms of health-care access (42% of children lack such access, vs. 32% nationally); infant mortality reaches 19.5/1000 in the state, with 14.2/1000 being the national ratio. In November, for the first time, Mexico will attend the VI Global Congress for the Rights of Children and Adolescents, which will coincide with the twenty-fifth anniversary of the UN Convention on the Rights of the Child, ratified by Mexico in 1990. This may be an opportunity to make visible the rights of youth, and to make them a reality…. This entry was posted on Saturday, March 15th, 2014 at 6:21 pm and is filed under Chiapas, Human Rights, Human Rights Defenders, Indigenous people, Justice system, Land and Territory, Land rights, religion, Women, Youth. You can follow any responses to this entry through the RSS 2.0 feed. You can leave a response, or trackback from your own site.